CHECK OUT OUR SOAP SUBSCRIPTION AND 50% OFF SALE! CLICK HERE! 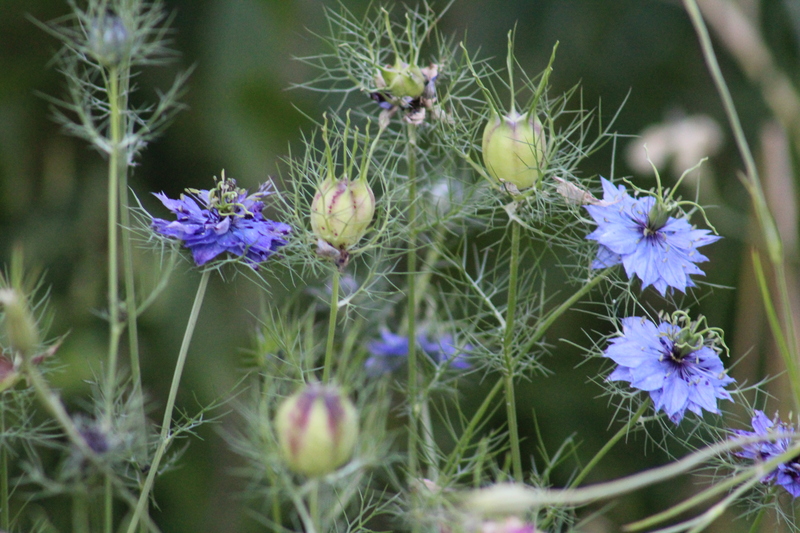 I’ll be the first to admit that love-in-a-mist has never been one of my “must have” flowers. Having never grown it before, I didn’t really know what to expect the first time I grew it. I mean, I knew that it was weird and kind of funky looking, but many times my impression of flowers will completely change after I grow them. The same was also true for nigella. Aside from the weird flower and seed pod shape, love in a mist has this cool characteristic about them that makes water droplets gather on the plant after it rains – it’s seriously so pretty. Like many hardy annuals, growing this cut flower is super easy as long as you know the limits of the plants’ cold hardiness and are willing to wait patiently for them to bloom in the spring. I usually grow two plantings of love in a mist flower. The first planting is made in the fall, and the second planting is made via the winter sowing method in the late winter/spring. If you’re unfamiliar with the winter sowing method, I have tons of videos and posts about it that might be helpful that I think are definitely worth checking out. My garden is in zone 6b/7. Due to the fact that my winters are very cold and wet (without snow), sowing some hardy annuals outdoors without frost protection is a little bit of a gamble. During a mild winter, about 75% of love-in-a-mist will survive my cold temperatures. However, I prefer to plant this flower with the help of either greenhouse plastic or a nice thick frost blanket to help ensure that I’ll get as many blooms as possible. While I’ve never seen it listed anywhere that these nigella seeds need a period of cold stratification, I usually go ahead and put the seed packet into the fridge for about a week, just to make extra certain. If you plan to do this too, make sure to keep it in a safe place away from kids or anyone else who might get into it. While I’m at it – anytime you’re growing something new, make sure to do a lot of research. Safety first! Anyhow, I usually start love-in-a-mist seeds outdoors in seed trays around the end of September for a fall planting. I start the seeds outdoors for a lot of reasons – no space indoors, no grow lights, and no hardening off time. Since we’re starting the seed outdoors, it does help to cover the seedlings with an insect barrier (just in case). Plants are tucked into the low tunnel for the winter and really require very little time of commitment from me. When spring comes, the temperatures will begin to warm and the plants will resume growth and bloom. I usually begin my second planting of love-in-a-mist flowers in January using the winter sowing method. These seedlings will be transplanted into the garden as soon as my soil can be worked in the spring. Since this sowing generally doesn’t have to worry about the coldest parts of winter, it does not require the use of greenhouse plastic or row covers, unless there’s a severe and sudden change in cooler temperatures. That’s about it for this post. Have you ever grown love-in-a-mist before? I would love to hear all about it in the comments below! Hope you’re having a great day! CLICK HERE TO SUBSCRIBE TO MY YOUTUBE CHANNEL FOR MORE GARDENING TIPS! Thanks for that awesome comment! Wreath making classes seriously sound like soooo much fun!